All Appetizers Served With Date- Tamarind And Mint Chutney. crisp, country fried pastries stuffed with spiced, tender potatoes and green peas. cubes of tender potatoes, sauteed & tossed in our sweet, sour, tangy, & spicy dressing. crisp flour wafers, cucumber, tomatoes, onions, chick peas, yogurt tossed in our sweet, sour, tangy, & spicy dressing. 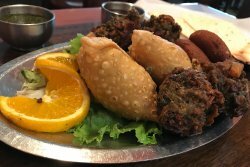 vegetable samosa, aloo tikki, pakoras papadums. young and tender skinless chicken, marinated 24 hours in house special exotic magic lands sensational marinade, baked on skewers to perfection in clay-oven. fresh tender boneless skinless chicken breasts marinated in velvety mellow marinade with zesty garlic, spices and extra virgin olive oil and charred in tan door. boneless skinless chicken deeply marinated in yogurt based, sensational marinated then baked in clay oven on skewers. ground lamb with sweet onions, fresh herbs & savory spices, flute shaped baked on skewers in tandoor. assortment of just perfect clay oven baked tandoori chicken, chicken tikka kebab, malai kebab and tantalizing seekh kebab. cubes of home made cheese deeply marinated yogurt based, sensational marinade then baked in the clay-oven on skewers. a mughlai novelty. 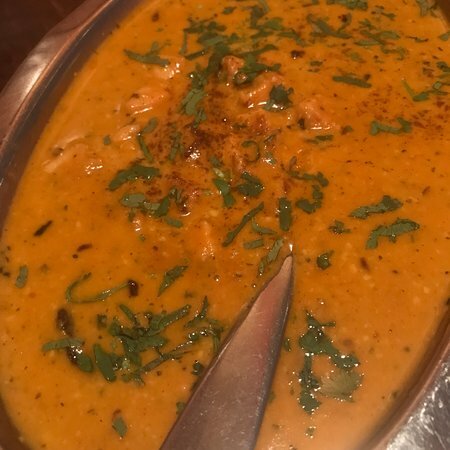 shrimp, chicken and cubes of home made un-aged and unprocessed cheese slowly simmered in yogurt, cream and coconut milk with herbs and spices. garnished with hard boiled egg slices. 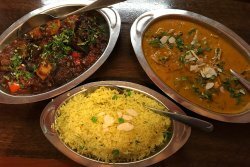 specialty from royal kitchen of nawab and nizam of hyderabad. shrimp sauteed with scallions, sweet onions, tomatoes and crisp bell peppers in spicy sweet and sour sensational sauce. large shrimp pan-seared with cream of coconut in exquisite cordial sauce. shrimp cooked in fiery sauce with tender potatoes, tomatoes and crisp green peppers. shrimp gently sauteed with golden fresh country vegetables, herbs and savory spices. large shrimp gently cooked in zesty creamy garlic sauce. exclusive recipe of maharaja patiala's kitchen. fresh eggplant smeared with herbs, spices, california golden raisins and nuts. tender florets of cauliflower gently sauteed with cashews, fresh herbs & tropic spices. our signature item. 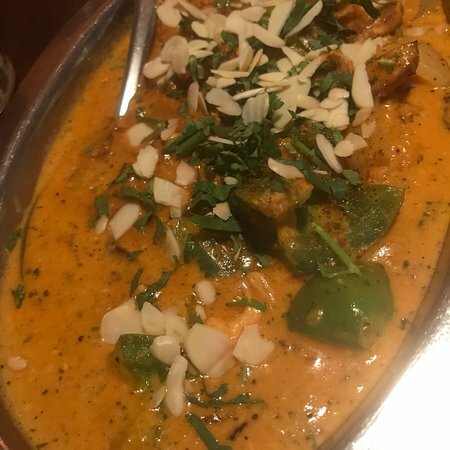 soft indian cheese sauteed with fresh crisp bell peppers, sweet onions, tomatoes and savory indian spices with a hint of fresh zesty garlic, ginger and fresh cilantro. our signature item. soft indian cheese slowly simmered in creamy coconut sauce with fresh mushrooms, nuts and raisins. home made un-aged, unprocessed cheese, and tender green peas cooked in succulent sauce with fresh herbs and spices. fresh cauliflower florets and tender potatoes cooked in onion and herb sauce with spices. potatoes and tender green peas cooked in delicious exotic spicy curry. speciality of rawalpindi, pakistan. chick peas simmered in a savory secret blend of fresh herbs and exotic spices. fresh idaho potatoes and paneer balls stuffed with nuts and golden raisins, rapid fried and then smothered in zesty velvety flurry of curry with tender green peas. All Biryani's Only Served With Raita And Chutney Garnished With Hard Boiled Egg Except. Vegetables Biryani. 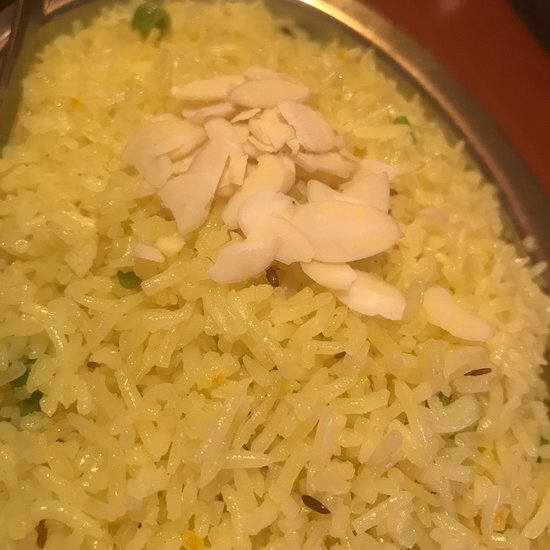 saffron rice slowly simmered with boneless chicken, herbs, spices, raisins and nuts. extra lean boneless leg of lamb tips simmered with basmati rice and gently seared with fresh herbs, tropic spices, nuts and raisins. saffron rice gently sauteed with spicy large shrimp, nut and raisins with a touch of fresh herbs. boneless chicken cooked with crisp and fresh bell peppers, sweet onions, tomatoes, garlic & ginger in incendiary sauce. boneless chicken kebabs slowly simmered in zesty garlic & ginger sensational sauce. our signature item. emperor shahjahan's favorite. boneless chicken sauteed with fresh mushrooms, herbs, savory spices nuts and california golden raisins, garnished with hard boiled egg. boneless chicken pan-seared in exotic spicy sauce. diced tender exotic malai kebab gently simmered in savory coconut cream sauce. our sensational signature item. diced fresh boneless chicken sauteed with scallions, sweet onions, tomatoes and crisp bell peppers in spicy sweet and sour sensational sauce with a hint of fresh zesty garlic and ginger. boneless chicken slowly simmered with golden fresh vegetables, herbs & savory spices. boneless chicken smothered in yogurt, coconut milk sauce with nuts and california golden raisins garnished with hard boiled egg slices. boneless chicken skillet seared in exotic creamed flurry of curry garnished with hard boiled egg slices. boneless chicken, tender potatoes cooked in hot, tangy, blistering sauce. lamb cooked with tender potatoes, and tomatoes in succulent sauce. very lean cubes of boneless lamb simmered in a flurry of curry topped with pan-seared crisp green chilies. tender juicy morsels of lamb gently sauteed in spicy sweet & sour sauce with fresh crisp bell peppers, sweet onions, shallots and vine ripe tomatoes. lamb cooked in onions, tomatoes, ginger, garlic based gravy, fresh herbs & tropic spices. lamb chunks slowly simmered with garden fresh vegetables, herbs & savory spices. lamb cubes cooked in special cream, yogurt and coconut sauce with fresh mushrooms, nuts, and california raisins. Breads Are Made To Order. Tandoori Breads And Baked On The Side Walls Of Our Clay Oven. flat leavened white bread topped with sesame and onion seeds. topped with fresh zesty garlic and cilantro brushed with butter. stuffed with fresh sweet onions and topped with spices, cilantro and butter. naan stuffed with fresh baby spinach and onions, topped with cumin seeds, spinach and butter. topped with red crushed pepper, green chili and cilantro brushed with butter. naan stuffed with paneer topped with cilantro and butter. stuffed with fresh cheddar cheese and onions, topped with spices, cilantro and butter. stuffed with ground lamb with fresh herbs and spices topped with fresh cilantro and butter. stuffed with nuts and raisins, then topped with melted butter and shredded coconut. unleavened whole wheat flat bread. low fat home made yogurt with cucumber and fresh mint. low fat home made yogurt. melon cucumber, onions, and tomatoes served with a special house dressing. lettuce, cucumber, onions and tomatoes served with our special dressing. Mon mari avait un une curry d'agneau au Chili et j'ai pris un curry de légumes plat. Nous avons aussi eu l'ail naan et le riz au safran. Nous avons terminé tout car tout était vraiment délicieux. J'adore leur petit déjeuner ainsi que le dîner. 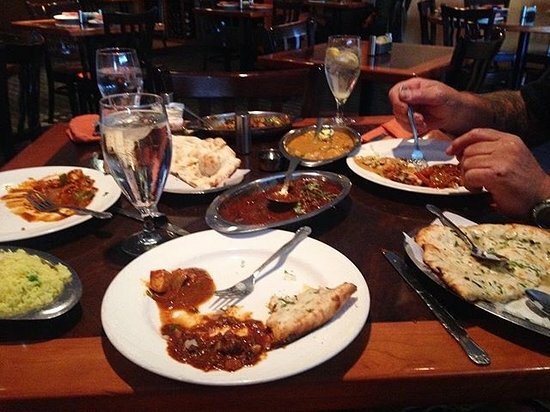 Le personnel est très gentil, c'est le meilleur restaurant indien de Kalamazoo. Ma seule suggestion serait qu'ils au directeur tient à la réception le Aloo Tiki. Je n'ai jamais rien mangé au safran un certain nombre de fois. A chaque fois, j'ai remarqué la qualité de la nourriture, et la gentillesse de son personnel. Ce que je veux dire, c'est que tout est super. Toutes les chambres simples et l'heure. Le restaurant indien de la ville. Le restaurant indien de la ville ! Le service est excellent et la nourriture délicieuse. Je vous conseille plutôt d'aller au buffet du déjeuner, il y a beaucoup de magasins d'alimentation pour un super prix. C'est l'un de Kalamazoo secrets les mieux gardés. La cuisine y est toujours délicieuse. Le personnel est très sympa. Je n'ai jamais eu une mauvaise expérience quand on va dans le safran. Obtenez des réponses rapides du personnel et personnes ayant visité le Saffron.